Featuring some of the biggest names in the game both past and present, we have an interesting and unique collection of hand-painted hockey figurines totaling 10, along with a hand-painted Detroit Red Wings display piece. The figurines are all just over 4 ½” with ceramic tops and black wooden bases, with each nicely hand-painted in the colour scheme of a particular team and player, with both the team and player’s name on affixed decals. Included, we have examples for Gretzky, Rocket Richard, Howe, Clarke, Mikita, Brodeur, Hull, Crosby, Yzerman and Alex Ovechkin. A few have been signed and dated on the underside of the base by the artist, with some from 2011. 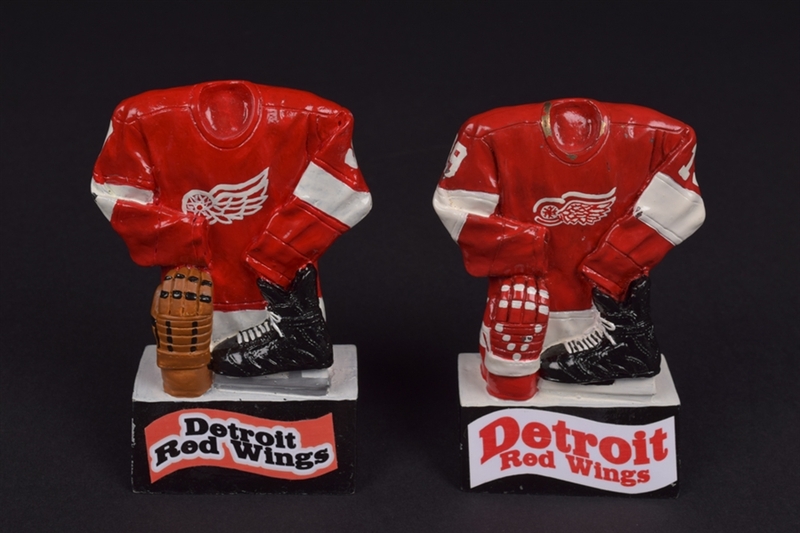 The Red Wings display piece is 10” in height with a wooden pedestal base, with a ceramic Nike bust figure with feathered headdress mounted along top. Red Wings decals have been added to each side, as well as the years they were Stanley Cup champions. With light to moderate wear present, the Red Wings piece has also been signed over the underside and dated “2013”.